HomeNew CarsNissan CarsNissan Micra ActiveNissan Micra Active FAQsWhat are the safety features in Nissan Micra Active? 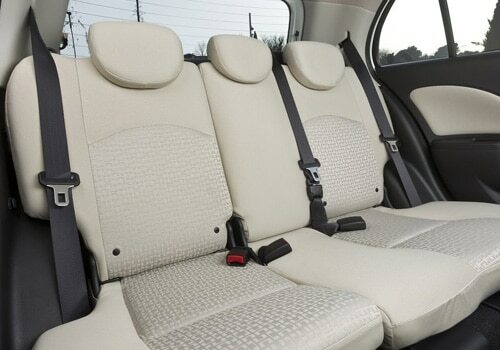 What are the safety features in Nissan Micra Active? The Nissan Micra Active comes with an array of safety features, which ensures the safety of the occupants in accidents. New Micra Active is bestowed with some impressive safety features such as an engine immobilizer, driver and front co-passenger airbags with supplemental restraint system that helps in the deployment of this airbag. Apart from these, there are a few other features like central door locking with remote keyless entry, the driver side power window has an auto down feature with an anti pinch function, child safety locks for the rear doors, powerful halogen headlamps for enhanced visibility for the driver, side and front impact beams, an electrical power steering with tilt adjustment, seat belts for added safety of the passengers, front wash and wiper for the windscreen. Then there are quite a few other notification lamps such as a driver seat belt warning notification, a door ajar warning indicator, a low fuel warning lamp, a head lamp on warning notification and also a key remove warning indicator as well. Apart from these, the company has also given this hatchback the highly advanced ABS + EBD + BA system, speed sensing automatic door locks and many more such functions.